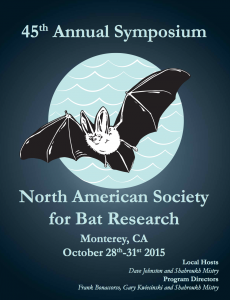 Winifred Frick, Ph.D. | The 45th North American Symposium of Bat Research begins! 28 Oct The 45th North American Symposium of Bat Research begins! The Frick Lab is excited for the start of the 45th Annual meeting of the North American Society of Bat Research. The meeting is held this year close to home in beautiful Monterey, California. Looking forward to seeing the community of bat researchers!